The Great Charter is one of the most famous documents in history. Regarded as the foundation of English civil liberty, it also stands as the historic prototype of later declarations of human freedom in various lands. In the Great Charter, as observed by Green, "the vague expressions of the older charters were exchanged for precise and elaborate provisions. The Great Charter marks the transition from the age of traditional rights to the age of written legislation, of parliaments and statutes, which was soon to come." King John of England, although compelled to submit to the loss of his French provinces in 1204, never after lost sight of plans for the renewal of the war with France. A bitter controversy with Pope Innocent III began over an election for the archbishopric of Canterbury, and resulted in a bull deposing John, 1212, with a command to Philip of France to execute the deposition. John made terms with the Pope by agreeing to hold his kingdom in fief from the pontiff, and to pay an annual tribute of one thousand marks (1213). John then invaded France, in alliance with Otho IV, Emperor of the Holy Roman Empire, and others, but was defeated at Bouvines, near Lille, 1214. This ended John's endeavors to recover his lost power in France, and he could only think henceforth of ruling peaceably his own kingdom and preserving, to his own advantage, his now close connection with the Pope. But although the English King's reign had been full of unfortunate events, the last and most grievous of his trials still awaited him, and "he was destined to pass through a series of more humiliating circumstances than had ever yet fallen to the lot of any other monarch." hastened by the exactions and impositions of John himself, and by personal as well as official conduct which rendered him odious to his people - these causes at length producing a general combination against him. The effect of John's lawless practices had already appeared in the general demand made by the barons of a restoration of their privileges; and after he had reconciled himself to the Pope, by abandoning the independence of the kingdom, he appeared to all his subjects in so mean a light that they universally thought they might with safety and honor insist upon their pretensions. But nothing forwarded this confederacy so much as the concurrence of Langton, Archbishop of Canterbury; a man whose memory, though he was obtruded on the nation by a palpable encroachment of the see of Rome, ought always to be respected by the English. This prelate - whether he was moved by the generosity of his nature and his affection to public good or had entertained an animosity against John, on account of the long opposition made by that prince to his election, or thought that an acquisition of liberty to the people would serve to increase and secure the privileges of the Church - had formed the plan of reforming the government. In a private meeting of some principal barons at London, he showed them a copy of Henry I's charter, which, he said, he had happily found in a monastery; and he exhorted them to insist on the renewal and observance of it. The barons swore that they would sooner lose their lives than depart from so reasonable a demand. The confederacy began now to spread wider, and to comprehend almost all the barons in England; and a new and more numerous meeting was summoned by Langton at St. Edmundsbury, under color of devotion. He again produced to the assembly the old charter of Henry; renewed his exhortations of unanimity and vigor in the prosecution of their purpose; and represented, in the strongest colors, the tyranny to which they had so long been subjected, and from which it now behooved them to free themselves and their posterity. The barons, inflamed by his eloquence, incited by the sense of their own wrongs, and encouraged by the appearance of their power and numbers, solemnly took an oath, before the high altar, to adhere to each other, to insist on their demands, and to make endless war on the King till he should submit to grant them. They agreed that, after the festival of Christmas, they would prefer in a body their common petition; and in the mean time they separated, after mutually engaging that they would put themselves in a posture of defence, would enlist men and purchase arms, and would supply their castles with the necessary provisions. The barons appeared in London on the day appointed, and demanded of the King, that, in consequence of his own oath before the primate, as well as in deference to their just rights, he should grant them a renewal of Henry's charter, and a confirmation of the laws of St. Edward. The King, alarmed with their zeal and unanimity, as well as with their power, required a delay; promised that, at the festival of Easter, he would give them a positive answer to their petition; and offered them the Archbishop of Canterbury, the Bishop of Ely, and the Earl of Pembroke as sureties for his fulfilling this engagement. The barons accepted of the terms, and peaceably returned to their castles. During this interval, John, in order to break or subdue the league of his barons, endeavored to avail himself of the ecclesiastical power, of whose influence he had, from his own recent misfortunes, had such fatal experience. He granted to the clergy a charter, relinquishing forever that important prerogative for which his father and all his ancestors had zealously contended; yielding to them the free election on all vacancies; reserving only the power to issue a "cong� d'�lire", and to subjoin a confirmation of the election; and declaring that, if either of these were withheld, the choice should nevertheless be deemed just and valid. the honor, liberty, and independence of the nation, with the same ardor which they now exerted in defence of their own. He wrote letters, therefore, to the prelates, to the nobility, and to the King himself. He exhorted the first to employ their good offices in conciliating peace between the contending parties, and putting an end to civil discord. To the second he expressed his disapprobation of their conduct in employing force to extort concessions from their reluctant sovereign; the last he advised to treat his nobles with grace and indulgence, and to grant them such of their demands as should appear just and reasonable. approbation of their cause. Besides that these men were seized with the national passion for laws and liberty, blessings of which they themselves expected to partake, there concurred very powerful causes to loosen their devoted attachment to the apostolic see. It appeared, from the late usurpations of the Roman Pontiff, that he intended to reap alone all the advantages accruing from that victory, which under his banners, though at their own peril, they had everywhere obtained over the civil magistrate. The Pope assumed a despotic power over all the churches; their particular customs, privileges, and immunities were treated with disdain; even the canons of general councils were set aside by his dispensing power; the whole administration of the Church was centred in the court of Rome; all preferments ran, of course, in the same channel; and the provincial clergy saw, at least felt, that there was a necessity for limiting these pretensions. The legate, Nicholas, in filling those numerous vacancies which had fallen in England during an interdict of 6 years, had proceeded in the most arbitrary manner; and had paid no regard, in conferring dignities, to personal merit, to rank, to the inclination of the electors, or to the customs of the country. The English Church was universally disgusted; and Langton himself, though he owed his elevation to an encroachment of the Romish see, was no sooner established in his high office than he became jealous of the privilege annexed to it, and formed attachments with the country subjected to his jurisdiction. These causes, though they opened slowly the eyes of men, failed not to produce their effect; they set bounds to the usurpations of the papacy; the tide first stopped, and then turned against the sovereign Pontiff; and it is otherwise inconceivable how that age, so prone to superstition, and so sunk in ignorance, or rather so devoted to a spurious erudition, could have escaped falling into an absolute and total slavery under the court of Rome. About the time that the Pope's letters arrived in England, the malcontent barons, on the approach of the festival of Easter, when they were to expect the King's answer to their petition, met by agreement at Stamford; and they assembled a force consisting of above 2,000 knights, besides their retainers and inferior persons without number. Elated with their power, they advanced in a body to Brackley, within 15 miles of Oxford, the place where the court then resided; and they there received a message from the King, by the Archbishop of Canterbury and the Earl of Pembroke, desiring to know what those liberties were which they so zealously challenged from their sovereign. They delivered to these messengers a schedule, containing the chief articles of their demands; which was no sooner shown to the King than he burst into a furious passion, and asked why the barons did not also demand of him his kingdom; swearing that he would never grant them such liberties as must reduce himself to slavery. No sooner were the confederate nobles informed of John's reply than they chose Robert Fitz-Walter their general, whom they called "the mareschal of the army of God and of Holy Church "; and they proceeded without further ceremony to levy war upon the King, They besieged the castle of Northampton during fifteen days, though without success; the gates of Bedford castle were willingly opened to them by William Beauchamp, its owner; they advanced to Ware on their way to London, where they held a correspondence with the principal citizens; they were received without opposition into the capital; and finding now the great superiority of their force, they issued proclamations, requiring the other barons to join them, and menacing them, in case of refusal or delay, with committing devastation on their houses and estates. In order to show what might be expected from their prosperous arms, they made incursions from London, and laid waste the King's parks and palaces; and all the barons, who had hitherto carried the semblance of supporting the royal party, were glad of this pretence for openly joining a cause which they always had secretly favored. The King was left at Odiham, in Hampshire, with a poor retinue of only 7 knights, and after trying several expedients to elude the blow, after offering to refer all differences to the Pope alone, or to 8 barons, 4 to be chosen by himself, and 4 by the confederates, he found himself at last obliged to submit at discretion. A conference between the King and the barons was appointed at Runnymede, between Windsor and Staines; a place which has ever since been extremely celebrated, on account of this great event. The two parties encamped apart, like open enemies; and after a debate of a few days, the King, with a facility somewhat suspicious, signed and sealed the charter which was required of him. 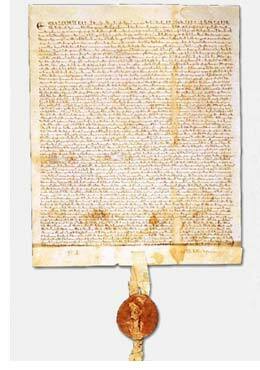 This famous deed, commonly called the "Great Charter," either granted or secured very important liberties and privileges to every order of men in the kingdom: to the clergy, to the barons, and to the people. The freedom of elections was secured to the clergy; the former charter of the King was confirmed, by which the necessity of a royal cong� d'�lire and confirmation was superseded; all check upon appeals to Rome was removed, by the allowance granted every man to depart the kingdom at pleasure, and the fines to be imposed on the clergy, for any offence, were ordained to be proportional to their lay estates, not to their ecclesiastical benefices. The privileges granted to the barons were either abatements in the rigor of the feudal law or determinations in points which had been left by that law or had become, by practice, arbitrary and ambiguous. The reliefs of heirs succeeding to a military fee were ascertained: an earl's and baron's at a 100 marks, a knight's at a 100 shillings. It was ordained by the charter that, if the heir be a minor, he shall, immediately upon his majority, enter upon his estate, without paying any relief; the king shall not sell his wardship; he shall levy only reasonable profits upon the estate, without committing waste or hurting the property; he shall uphold the castles, houses, mills, parks, and ponds, and if he commit the guardianship of the estate to the sheriff or any other, he shall previously oblige them to find surety to the same purpose. During the minority of a baron, while his lands are in wardship, and are not in his own possession, no debt which he owes to the Jews shall bear any interest. Heirs shall be married without disparagement; and before the marriage be contracted, the nearest relatives of the person shall be informed of it. A widow, without paying any relief, shall enter upon her dower, the third part of her husband's rents; she shall not be compelled to marry, so long as she chooses to continue single; she shall only give security never to marry without her lord's consent. The king shall not claim the wardship of any minor who holds lands by military tenure of a baron, on pretence that he also holds lands of the crown by socage or any other tenure. Scutages shall be estimated at the same rate as in the time of Henry I; and no scutage or aid, except in the three general feudal cases - the king's captivity, the knighting of his eldest son, and the marrying of his eldest daughter - shall be imposed but by the great council of the kingdom; the prelates, earls, and great barons shall be called to this great council, each by a particular writ; the lesser barons by a general summons of the sheriff. The king shall not seize any baron's land for a debt to the crown if the baron possesses as many goods and chattels as are sufficient to discharge the debt. No man shall be obliged to perform more service for his fee than he is bound to by his tenure. No governor or constable of a castle shall oblige any knight to give money for castle guard, if the knight be willing to perform the service in person, or by another able-bodied man; and if the knight be in the field himself, by the king's command, he shall be exempted from all other service of this nature. No vassal shall be allowed to sell so much of his land as to incapacitate himself from performing his service to his lord. These were the principal articles, calculated for the interest of the barons; and had the charter contained nothing further, national happiness and liberty had been very little promoted by it, as it would only have tended to increase the power and independence of an order of men who were already too powerful, and whose yoke might have become more heavy on the people than even that of an absolute monarch. But the barons, who alone drew and imposed on the prince this memorable charter, were necessitated to insert in it other clauses of a more extensive and more beneficent nature: they could not expect the concurrence of the people without comprehending, together with their own, the interests of inferior ranks of men; and all provisions which the barons for their own sake were obliged to make in order to insure the free and equitable administration of justice, tended directly to the benefit of the whole community. The following were the principal clauses of this nature: It was ordained that all the privileges and immunities above mentioned, granted to the barons against the King, should be extended by the barons to their inferior vassals. The King bound himself not to grant any writ empowering a baron to levy aid from his vassals except in the three feudal cases. One weight and one measure shall be established throughout the kingdom. refused, or delayed by them. Circuits shall be regularly held every year; the inferior tribunals of justice, the county court, sheriff's turn, and courtleet shall meet at their appointed time and place; the sheriffs shall be incapacitated to hold pleas of the crown, and shall not put any person upon his trial, from rumor or suspicion alone, but upon the evidence of lawful witnesses. No freeman shall be taken or imprisoned, or dispossessed of his free tenement and liberties, or outlawed, or banished, or anywise hurt or injured, unless by the legal judgment of his peers or by the law of the land; and all who suffered otherwise in this or the two former reigns shall be restored to their rights and possessions. Every freeman shall be fined in proportion to his fault; and no fine shall be levied on him to his utter ruin; even a villein or rustic shall not by any fine be bereaved of his carts, ploughs, and implements of husbandry. This was the only article calculated for the interests of this body of men, probably at that time the most numerous in the kingdom. It must be confessed that the former articles of the Great Charter contain such mitigations and explanations of the feudal law as are reasonable and equitable; and that the latter involve all the chief outlines of a legal government, and provide for the equal distribution of justice and free enjoyment of property; the great objects for which political society was at first founded by men, which the people have a perpetual and unalienable right to recall, and which no time, nor precedent, nor statute, nor positive institution ought to deter them from keeping ever uppermost in their thoughts and attention. Though the provisions made by this charter might, conformably to the genius of the age, be esteemed too concise, and too bare of circumstances to maintain the execution of its articles, in opposition to the chicanery of lawyers, supported by the violence of power, time gradually ascertained the sense of all the ambiguous expressions; and those generous barons, who first extorted this concession, still held their swords in their hands, and could turn them against those who dared, on any pretence, to depart from the original spirit and meaning of the grant. We may now, from the tenor of this charter, conjecture what those laws were of King Edward, which the English nation, during so many generations, still desired, with such an obstinate perseverance, to have recalled and established. They were chiefly these latter articles of Magna Charta; and the barons who, at the beginning of these commotions, demanded the revival of the Saxon laws, undoubtedly thought that they had sufficiently satisfied the people by procuring them this concession, which comprehended the principal objects to which they had so long aspired. But what we are most to admire is the prudence and moderation of those haughty nobles themselves who were enraged by injuries, inflamed by opposition, and elated by a total victory over their sovereign. They were content, even in this plenitude of power, to depart from some articles of Henry I's charter, which they made the foundation of their demands, particularly from the abolition of wardships, a matter of the greatest importance; and they seem to have been sufficiently careful not to diminish too far the power and revenue of the crown. If they appear, therefore, to have carried other demands to too great a height, it can be ascribed only to the faithless and tyrannical character of the King himself, of which they had long had experience, and which they foresaw would, if they provided no further security, lead him soon to infringe their new liberties, and revoke his own concessions. This alone gave birth to those other articles, seemingly exorbitant, which were added as a rampart for the safeguard of the Great Charter. The barons obliged the King to agree that London should remain in their hands, and the Tower be consigned to the custody of the Primate till the 15th of August ensuing or till the execution of the several articles of the Great Charter. The better to insure the same end, he allowed them to choose five-and-twenty members from their own body as conservators of the public liberties; and no bounds were set to the authority of these men either in extent or duration. If any complaint were made of a violation of the charter, whether attempted by the king, justiciaries, sheriffs, or foresters, any four of these barons might admonish the king to redress the grievance; if satisfaction were not obtained, they could assemble the whole council of twenty-five; who, in conjunction with the great council, were empowered to compel him to observe the charter, and, in case of resistance, might levy war against him, attack his castles, and employ every kind of violence except against his royal person and that of his queen and children. All men throughout the kingdom were bound, under the penalty of confiscation, to swear obedience to the twenty-five barons; and the freeholders of each county were to choose 12 knights, who were to make report of such evil customs as required redress, conformably to the tenor of the Great Charter. The names of those conservators were: the Earls of Clare, Albemarle, Gloucester, Winchester, Hereford; Roger Bigod, Earl of Norfolk; Robert de Vere, Earl of Oxford; William Mareschal, the younger; Robert Fitz-Walter, Gilbert de Clare, Eustace de Vescey, Gilbert Delaval, William de Moubray, Geoffrey de Say, Roger de Mombezon, William de Huntingfield; Robert de Ros, the Constable of Chester; William de Aubenie, Richard de Perci, William Malet, John Fitz-Robert, William de Lanvalay, Hugh de Bigod, and Roger de Montfichet. These men were, by this convention, really invested with the sovereignty of the kingdom; they were rendered co�rdinate with the King, or rather superior to him, in the exercise of the executive power; and as there was no circumstance of government which, either directly or indirectly, might not bear a relation to the security or observance of the Great Charter, there could scarcely occur any incident in which they might not lawfully interpose their authority. John seemed to submit passively to all these regulations, however injurious to majesty. He sent writs to all the sheriffs ordering them to constrain everyone to swear obedience to the 25 barons; he dismissed all his foreign forces; he pretended that his government was thenceforth to run in a new tenor and be more indulgent to the liberty and independence of his people. But he only dissembled till he should find a favorable opportunity for annulling all his concessions. The injuries and indignities which he had formerly suffered from the Pope and the King of France, as they came from equals or superiors, seemed to make but small impression on him; but the sense of this perpetual and total subjection under his own rebellious vassals sank deep in his mind; and he was determined, at all hazards, to throw off so ignominious a slavery. He grew sullen, silent, and reserved; he shunned the society of his courtiers and nobles; he retired into the Isle of Wight, as if desirous of hiding his shame and confusion; but in this retreat he meditated the most fatal vengeance against all his enemies. He secretly sent abroad his emissaries to enlist foreign soldiers, and to invite the rapacious Braban�ons into his service, by the prospect of sharing the spoils of England and reaping the forfeitures of so many opulent barons who had incurred the guilt of rebellion by rising in arms against him. And he despatched a messenger to Rome, in order to lay before the Pope the Great Charter, which he had been compelled to sign, and to complain, before that tribunal, of the violence which had been imposed upon him. Innocent, considering himself as feudal lord of the kingdom, was incensed at the temerity of the barons, who, though they pretended to appeal to his authority, had dared, without waiting for his consent, to impose such terms on a prince, who, by resigning to the Roman pontiff his crown and independence, had placed himself immediately under the papal protection. He issued, therefore, a bull, in which, from the plenitude of his apostolic power, and from the authority which God had committed to him, to build and destroy kingdoms, to plant and overthrow, he annulled and abrogated the whole charter, as unjust in itself, as obtained by compulsion, and as derogatory to the dignity of the apostolic see. He prohibited the barons from exacting the observance of it; he even prohibited the King himself from paying any regard to it; he absolved him and his subjects from all oaths which they had been constrained to take to that purpose; and he pronounced a general sentence of excommunication against everyone who should persevere in maintaining such treasonable and iniquitous pretensions. The King, as his foreign forces arrived along with this bull, now ventured to take off the mask; and, under sanction of the Pope's decree, recalled all the liberties which he had granted to his subjects, and which he had solemnly sworn to observe. But the spiritual weapon was found upon trial to carry less force with it than he had reason from his own experience to apprehend. The Primate refused to obey the Pope in publishing the sentence of excommunication against the barons; and though he was cited to Rome, that he might attend a general council there assembled, and was suspended, on account of his disobedience to the Pope and his secret correspondence with the King's enemies; though a new and particular sentence of excommunication was pronounced by name against the principal barons - John still found that his nobility and people, and even his clergy, adhered to the defence of their liberties and to their combination against him; the sword of his foreign mercenaries was all he had to trust to for restoring his authority. The barons, after obtaining the Great Charter, seem to have been lulled into a fatal security, and to have taken no rational measures, in case of the introduction of a foreign force, for reassembling their armies. The King was, from the first, master of the field, and immediately laid siege to the castle of Rochester, which was obstinately defended by William de Albiney, at the head of 140 knights with their retainers, but was at last reduced by famine. John, irritated with the resistance, intended to have hanged the governor and all the garrison; but on the representation of William de Mauleon, who suggested to him the danger of reprisals, he was content to sacrifice, in this barbarous manner, the inferior prisoners only. The captivity of William de Albiney, the best officer among the confederated barons, was an irreparable loss to their cause; and no regular opposition was thenceforth made to the progress of the royal arms. The ravenous and barbarous mercenaries, incited by a cruel and enraged prince, were let loose against the estates, tenants, manors, houses, parks of the barons, and spread devastation over the face of the kingdom. Nothing was to be seen but the flames of villages, and castles reduced to ashes, the consternation and misery of the inhabitants, tortures exercised by the soldiery to make them reveal their concealed treasures, and reprisals no less barbarous, committed by the barons and their partisans on the royal demesnes, and on the estates of such as still adhered to the Crown. The King, marching through the whole extent of England, from Dover to Berwick, laid the provinces waste on each side of him, and considered every estate which was not his immediate property as entirely hostile and the object of military execution. The nobility of the North in particular, who had shown greatest violence in the recovery of their liberties, and who, acting in a separate body, had expressed their discontent even at the concessions made by the Great Charter, as they could expect no mercy, fled before him with their wives and families, and purchased the friendship of Alexander, the young King of Scots, by doing homage to him. The barons, reduced to this desperate extremity, and menaced with the total loss of their liberties, their properties, and their lives, employed a remedy no less desperate; and making applications to the court of France, they offered to acknowledge Louis, the eldest son of Philip, for their sovereign, on condition that he would afford them protection from the violence of their enraged Prince. Though the sense of the common rights of mankind, the only rights that are entirely indefeasible, might have justified them in the deposition of their King, they declined insisting before Philip on a pretension which is commonly so disagreeable to sovereigns and which sounds harshly in their royal ears. They affirmed that John was incapable of succeeding to the crown, by reason of the attainder passed upon him during his brother's reign, though that attainder had been reversed, and Richard had even, by his last will, declared him his successor. They pretended that he was already legally deposed by sentence of the peers of France, on account of the murder of his nephew, though that sentence could not possibly regard anything but his transmarine dominions, which alone he held in vassalage to that crown. On more plausible grounds they affirmed that he had already deposed himself by doing homage to the Pope, changing the nature of his sovereignty, and resigning an independent crown for a fee under a foreign power. And as Blanche of Castile, the wife of Louis, was descended by her mother from Henry II, they maintained, though many other princes stood before her in the order of succession, that they had not shaken off the royal family in choosing her husband for their sovereign. kingdom; and having obtained this security, he sent over first a small army to the relief of the confederates; then more numerous forces, which arrived with Louis himself at their head. The first effect of the young Prince's appearance in England was the desertion of John's foreign troops, who, being mostly levied in Flanders and other provinces of France, refused to serve against the heir of their monarchy. The Gascons and Poictevins alone, who were still John's subjects, adhered to his cause; but they were too weak to maintain that superiority in the field which they had hitherto supported against the confederated barons. Many considerable noblemen deserted John's party - the earls of Salisbury, Arundel, Warrenne, Oxford, Albemarle, and William Mareschal the Younger. His castles fell daily into the hands of the enemy; Dover was the only place which, from the valor and fidelity of Hubert de Burgh, the governor, made resistance to the progress of Louis; and the barons had the melancholy prospect of finally succeeding in their purpose, and of escaping the tyranny of their own King, by imposing on themselves and the nation a foreign yoke. But this union was of short duration between the French and English nobles; and the imprudence of Louis, who on every occasion showed too visible a preference to the former, increased their jealousy which it was so natural for the latter to entertain in their present situation. The Viscount of Melun, too, it is said, one of his courtiers, fell sick at London, and, finding the approaches of death, he sent for some of his friends among the English barons, and, warning them of their danger, revealed Louis's secret intentions of exterminating them and their families as traitors to their Prince, and of bestowing their estates and dignities on his native subjects, in whose fidelity he could more reasonably place confidence. This story, whether true or false, was universally reported and believed; and, concurring with other circumstances which rendered it credible, did great prejudice to the cause of Louis. The Earl of Salisbury and other noblemen deserted again to John's party; and as men easily change sides in civil war, especially where their power is founded on a hereditary and independent authority and is not derived from the opinion and favor of the people, the French Prince had reason to dread a sudden reverse of fortune.